Both the title and subtitles are very important information about the card. OVP card title and subtitle can be maximum of 3 and 2 lines respectively. Unit of measure (if any) of data point will be added to the subtitle as a suffix. In case of KPI Header If the subtitle is not mentioned in manifest then it will read from data point annotation description property string or path. Counter information displays the number of items out of the total number of items on the top right corner of the card. In case, all the items are displayed on the card, the counter information is not displayed. OVP card KPI can be set using dataPointAnnotationPath setting of the card which should point to a datapoint annotation. KPI value is the aggregation of data point annotation value property. in this example, its aggregation of GrossAmount property value and this aggregation is done at the backend side. The direction of the arrow pointing up or down depends on the property values (ReferenceValue, UpDifference, DownDifference) mentioned under TrendCalculation in the annotations and KPI value. If you want to show KPI value in percentage then you need to add following annotation for the KPI value property (here for example GrossAmount). <Property Name="GrossAmount" Type="Edm.Decimal" Precision="16" Scale="3" sap:unit="CurrencyCode" sap:label="Gross Amt." This Unit of measure will also be added in card subtitle as a suffix. View switches allow the end user to choose from different available views within the same card. For the cards that need to show multiple views, we need to specify a property “tabs” in the manifest file. The “tabs” property consists of an array of card properties. These card properties include information about the LineItem, SelectionVariant, PresentationVariant, etc. Each value in the “tabs” array denote a different view which is to be shown in the card. I have not specified different settings for tabs for the sake of simplicity, but you can play around it and change the settings of each tab. 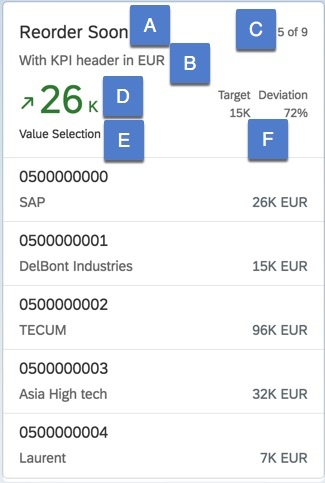 We have successfully created a list card with KPI header including title, dynamic subtitle, KPI value, trend arrow, selection information, target and deviation information and view switches. We also learnt about different card settings and annotations related to card headers and KPIs.